The most well-known of all the tool watches, whether you’re sitting in the pilot’s seat or just enjoying the view from 40,000 feet, our round up of the best pilot watches will help you find the right tool for pilots and aviation enthusiasts alike. On April 1st 2018, the Royal Air Force proudly celebrated its centenary. When it was initially formed towards the end of World War I, it was the most powerful air force in the world with over 290,000 personnel and nearly 23,000 aircraft. Just 21 years later during World War II, the RAF counted some 1,208,000 members and 185,000 serving aircrew. A key moment in the history of the RAF was the Battle of Britain. The first major battle to be fought entirely by air involving just 1,200 RAF aircraft against over 3,000 of the Luftwaffe fighters and bombers, it was a critical factor in preventing the Nazi invasion of Britain. Winston Churchill famously said of the RAF victory that ‘never in the history of human conflict has so much been owed by so many to so few’. To commemorate the RAF100, along with 100 days of events culminating in a week long celebration in London, watch brands such as Breitling and Bremont have designed special watches to celebrate the RAF’s heritage. These Bremont watches combine classic pilot watch style with a nod to the signature RAF style. A high contrast dial (think white numerals on a black background) with lots of lume and minimal design details will make reading your watch at 40,000 feet a breeze. Accuracy is extremely important for a pilot’s watch. Whilst you won’t necessarily need chronometer level precision, a watch which has a high level of accuracy as well as being shock-resistant will ensure your timing is as precise as you need it to be. Magnetism, and its ability to make watches inaccurate has always been the enemy of pilot watches. Anti-magnetic watches can overcome this problem with iron faraday cages, specialised alloys, or even anti-magnetic silicon hairsprings. Specialised aviation features such as slide-rule bezels and fly-back chronographs can, in theory, allow you to perform all the calculations you’ll ever need in the air. Originally designed to be worn over a flight suit, the classic large diameter of a pilot watch gives great readability, whilst a large, textured crown will help you operate its functions with gloves on. Whether you’re in the pilot’s seat or not, our pick of the best watches for pilots will help you find the right watch for navigating every adventure. The instrument of choice for professional pilots since the 1930’s, Breitling’s link to aviation resonates to this very day. In 1936, they launched an aviator chronograph with a black dial, striking luminescent numerals, and a practical rotating bezel; today they honour over 80 years of aviation heritage with the release of the Breitling Navitimer 8. Featuring a Rattrapante, or split-second chronograph, this Breitling Navitimer allows you to stop and re-start the split-second timing hand as many times as you need during a timing operation. The face of Breitling’s aviation heritage, the Breitling Jet Team is the world’s largest professional civilian flight team. Displaying a concentrated blend of technique, mastery and style, this unique arial acrobatics team perform manoeuvres within 3 meters of each other, at speeds of over 700 km/h. At tolerances like these, precision is imperative. A passion that has coursed through the veins of Bremont’s founders since very early childhood, the love of aviation and its uncompromising demands have helped to shape and define every Bremont watch. During flight, your watch will be subjected to continuous vibration which can affect its accuracy. Bremont’s Anti-Shock Movement Mount features a unique rubberised mount which encloses the movement, suspending it within the outer case and allowing much of the shock energy to be absorbed. Arguably the ultimate aviation timepiece, the Bremont Wright Flyer represents a ground-breaking moment in watchmaking history, and is the brand’s most unique Limited Edition piece to date. Including original material from the wings of the Wright Flyer - the first ever flying aircraft, this beautiful watch pays tribute to the very beginning of aviation. 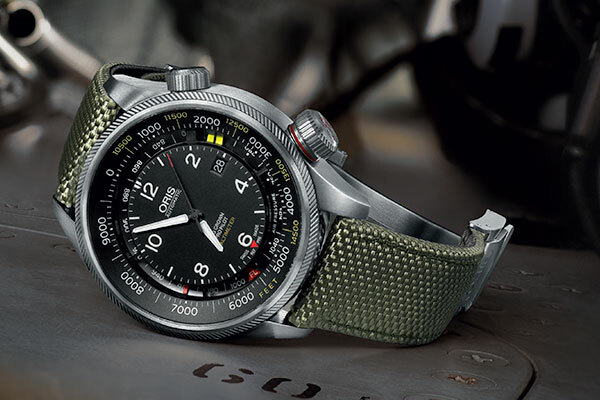 A great choice if you want a vintage pilot watch, Oris’ distinguished collection of aviation watches hark back to their beginning in the 1940’s, and are designed and tested in collaboration with former pilots of the Swiss Air Force. Always looking for new and innovative ways to serve the aviation community, Hamilton became the official watch of commercial airlines in the U.S. in the 1930’s. Today they work with air squadrons all over the world and are the Official Timekeeper of the Red Bull Air Race World Championship - one of the most exciting and high-adrenaline sports in the world. Making history in its own right, the Hamilton Kahki X-Wind collection features the first drift angle calculator to ever appear on a watch. Throwing out the rule book when it comes to the accepted traditions of pilot watch design, a citizen watch gives you all the information you could ever need in the air right at your fingertips. Boasting features such as World Time, UTC display, shock sensor and a built in compass, Citizen continues to break boundaries in both performance and style. Potentially detrimental to your watch’s accuracy, magnetism can be a big problem for pilots. To overcome this, some watches such as the Bremont MBI II encase the movement in a soft-iron Faraday cage which routes any potentially damaging magnetism around the movement. A function which enables you to instantly reset and restart the chronograph, this is an extremely practical function for a pilot, especially during a series of timed aerobatic manoeuvres which follow on immediately from one another. It also plays an important role in military aviation, as it allows the pilot to read the timing for two consecutive events simultaneously. In the time before the widespread availability of modern calculation devices, navigational calculations were performed with a slide rule. Originally popularised by Breitling on it s 1952 Navitimer, the miniature rotary slide rule is probably the feature most readily associated with pilot watches and is capable of making all the calculations necessary for in-flight navigation. A useful function if flying long distances, a GMT watch is designed to show two timezones simultaneously. GMT (which stands for Greenwich Mean Time) is the zero point on the 24 hours scale of international timezones. From here, all other timezones are either plus or minus GMT. Your GMT watch can be set to both the local and GMT time, which will then enable you to calculate the time anywhere in the world by simply adding or subtracting the right number of hours. If your watch has a GMT bezel, you can also use this to track a third timezone. Find out more in our Watch Glossary. Clean, minimalist aesthetics and large case sizes equals a watch that will always make an impact. Add some retro-styling into the mix and you’ll be taking the fashion lead. Designed to be tough and resilient, a pilot’s watch will keep up with any pace of life - even if your feet never leave the ground. Although they don’t have to be complicated, some pilot watches are equipped with a range of gadgets that are guaranteed to impress. Our round-up of the best sailing watches will help you get the most out of your adventures on the water. 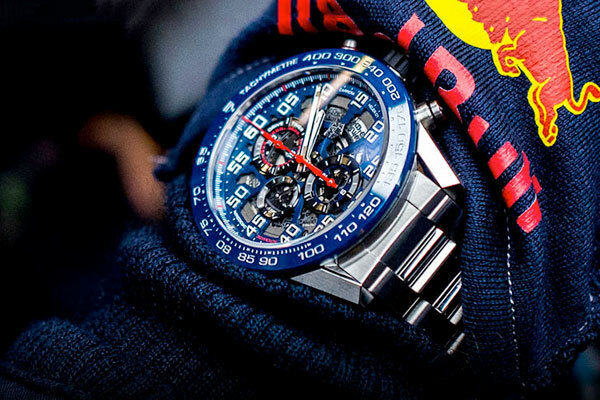 Read our guide on the raciest motorsport watches, inspired by the high-speed world of Formula 1. What makes Swiss watches so special? Discover our ultimate guide to Swiss horology.